Nutrition labels on food packaging give a breakdown of the energy and nutritional content of the food per 100g or 100ml of the food: Most pre-packed foods have a nutrition label on the back or side of the packaging. For example, the image below shows the back of pack nutrition label on a loaf of white bread. This is the amount of energy that the food will give you when you eat it. It is measured in both kilojoules (kJ) and kilocalories (kcal), usually referred to as calories. An average man needs around 10,500kJ (2,500kcal) a day to maintain his weight. For an average woman, the daily figure is around 8,400kJ (2,000kcal). There are three types of fat found in our food: saturated fat, trans fat and unsaturated fat. The main contributors to fat in our diet are the saturated and unsaturated fats. As part of a healthy diet, we should try to cut down on food that is high in saturated fat. Eating a diet that is high in saturated fat can raise the level of cholesterol in the blood, which in turn increases the risk of heart disease. Simple carbohydrates are often listed on nutrition labels as “carbohydrates (of which sugars)”. This includes added sugars and the natural sugars found in fruit and milk. Complex carbohydrates (starchy foods) include bread, cereals, rice, pasta and potatoes. We should get most of our energy from complex carbohydrates rather than those containing sugar. Sometimes you will only see a total figure for carbohydrates on nutrition labels. This includes the carbohydrates from complex carbohydrates and from simple carbohydrates. Sugars occur naturally in foods such as fruit and milk. Sugars are also added to a wide range of foods such as sweets, cakes, biscuits and chocolates. Many foods that contain added sugars also contain a lot of energy (kJ/kcal) so eating these foods can often contribute to you being overweight. Sugary foods and drinks can also cause tooth decay, especially when eaten between meals. The body needs protein to grow and repair itself. Protein-rich foods include meat, fish, milk and dairy foods, eggs, beans, lentils and nuts. Guidelines indicating whether a food is high or low in fat, saturated fat, salt or sugar. Reference intakes are guidelines about the approximate amount of particular nutrients and energy required for a healthy diet. They give a useful indication of how a particular nutrient or amount of energy fits into your daily diet. 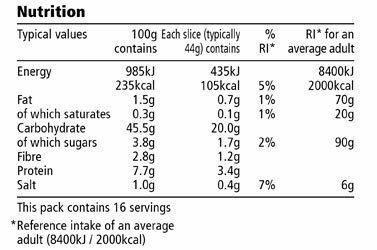 For example, the label below shows that each pie will provide you with 19.2 grams of sugars, which represents 21% of your RI for sugars (i.e. this pack contains about a fifth of an adult’s RI of sugars). Some front-of-pack nutrition labels use red, amber and green colour-coding. 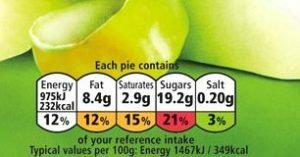 Colour-coded nutritional information (shown in image below) indicates at a glance if the food has high, medium or low amounts of fat, saturated fat, sugars and salt. Most pre-packed food products also have a list of ingredients on the packaging or on an attached label. Ingredients are listed in order of weight, so the main ingredients in the packaged food always come first. 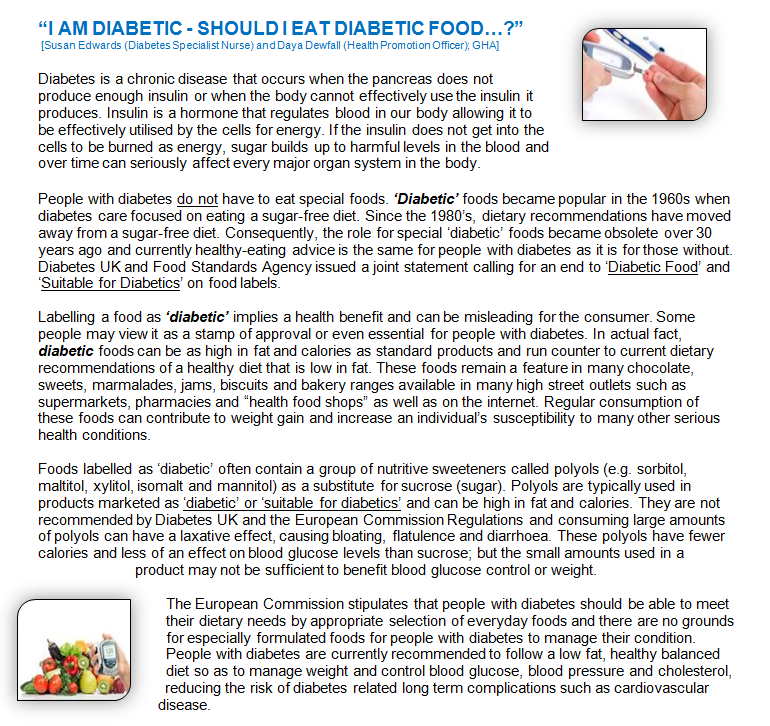 Food labels provide a wide range of information about foods. However, it is important that we understand all of that information i if we are to make use of it. For example, if a food product is labeled “light” or “lite” or has “no added sugar” what does this mean? You will see “use by” dates on food that goes off quickly, such as smoked fish, meat products and ready-prepared salads. Do not use any food or drink after the end of the “use by” date on the label, even if it looks and smells fine. This is because using it after this date could put your health at risk. For the “use by” date to be a valid guide, you must follow storage instructions such as “keep in a refrigerator”. If you don’t follow these instructions, the food will spoil more quickly and you may risk food poisoning. Once a food with a “use by” date on it has been opened, you also need to follow any instructions such as “eat within three days of opening”. If a food can be frozen, its life can be extended beyond the “use by” date. But make sure you follow any instructions on the pack, such as “cook from frozen” or “defrost thoroughly before use and use within 24 hours”. 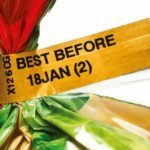 “Best before” dates appear on a wide range of frozen, dried, tinned and other foods. These dates are about quality, not safety. When the date is passed, it doesn’t necessarily mean that the food will be harmful, but it might begin to lose its flavour and texture. Remember, the “best before” date will only be accurate if the food is stored according to the instructions on the label, such as “store in a cool dry place” or “keep in the fridge once opened”. 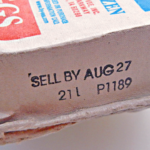 Date marks such as “display until” or “sell by” often appear near or next to the “best before” or “use by” date. These are instructions for shop staff, not for shoppers. Food packaging often makes health claims for the food, such as, “helps maintain a healthy heart”, or “helps aid digestion”. Any claims made about the nutritional and health benefits of a food must be based on science. Only claims that have been approved by the European Commission can be used on food packaging. General claims about benefits to overall good health, such as “healthy” or “good for you”, are only allowed if accompanied by an approved claim. This means that these claims must be backed up by an explanation of why the food is “healthy”. Labels are not allowed to claim that food can treat, prevent or cure any disease or medical condition. These sorts of claims can only be made for licensed medicines. To say that a food is “light” or “lite”, it must be at least 30% lower in at least one typical value, such as calories or fat, than standard products. The label must explain exactly what has been reduced and by how much, for example “light: 30% less fat”. The easiest way to compare products is to look at the information per 100g. “No added sugar” or “unsweetened” refer to sugar or sweeteners that are added as ingredients. They do not mean that the food contains no sugar. The ingredients lists on food products with “no added sugar” and “unsweetened” labels will tell you what ingredients have been used, including what types of sweetener and sugar. This usually means that no sugar or sweetener has been added to the food to make it taste sweet. This doesn’t necessarily mean that the food will not contain naturally occurring sugars as those found in fruit or milk. The ingredients in the food, including additives, are listed in descending order of weight at the time they were used to make the food. If flavorings have been used, the label must indicate this. The ingredients list must also highlight any allergens (foods that some people are allergic to), such as eggs, nuts and soya where used as ingredients. In addition, there will usually also be the manufacturer’s name and address, a date mark, instructions for safe storage and the weight of the product. If you’re buying ready meals, check to see if there’s a nutrition label on the front of the pack, and then see how your choices stack up when it comes to the amount of energy, fat, saturated fat, sugars and salt. If the nutrition labels are colour-coded, you will often find a mixture of red, amber and green. So, when you’re choosing between similar products, try to go for more greens and ambers, and fewer reds, if you want to make a healthier choice. Where possible, always opt for fresh fruit and vegetables. Remember that even healthier ready meals may be higher in fat and energy than the homemade equivalent. If you make the meal yourself, you could save money too.